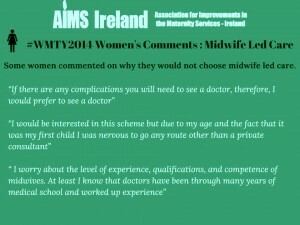 What were the choices available to women in terms of maternity care in Ireland and what did they think of them? This discussion is based on the AIMSI What Matters To You survey results of 2014 -2015. 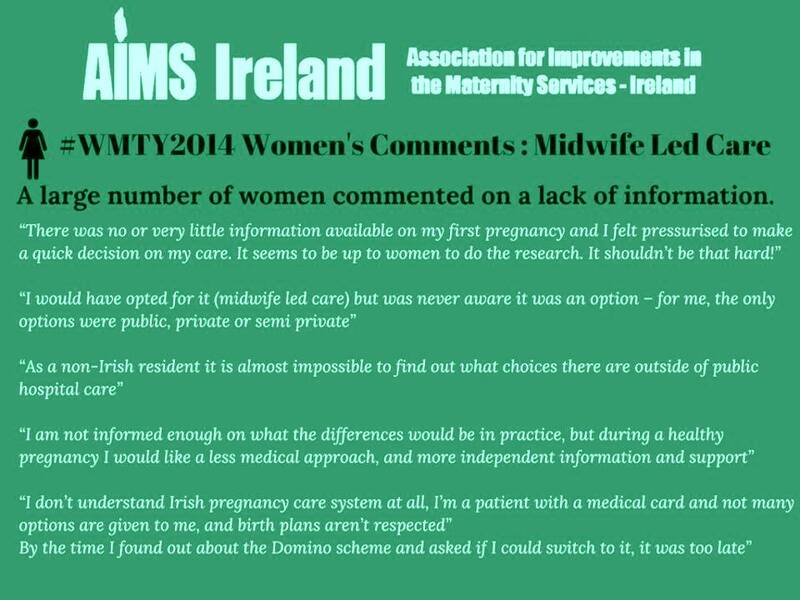 In spring of 2014 AIMS Ireland ran an electronic survey on the topic of “What Matters to YOU?”. 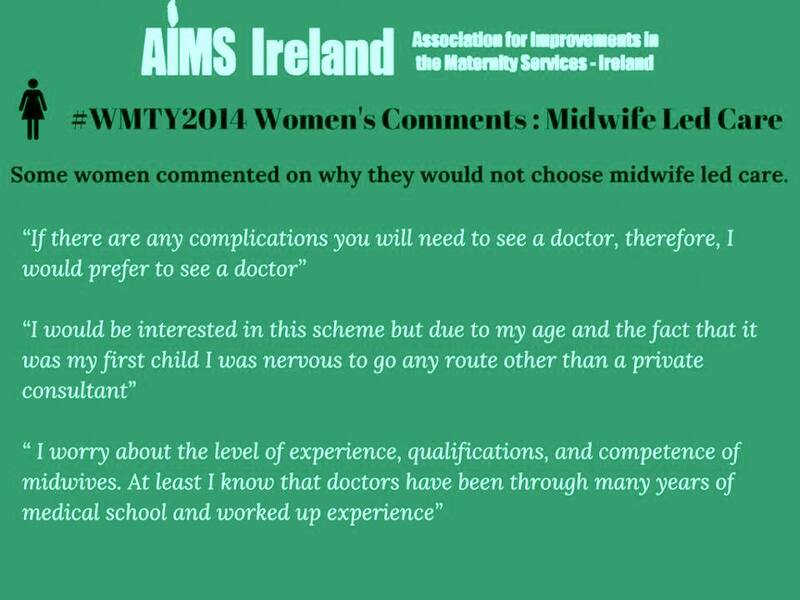 It was available through the AIMSI website (www.aimsireland.ie), AIMS Ireland social media, parenting pages, and was also shared widely through social media channels (twitter and facebook groups), and Irish Health.com. The survey was self-selecting and open to anyone who wished to fill it in who had given birth in Ireland between 2010-214. Respondents who completed the survey were anonymous. It was voluntarily completed by 2, 836 women. 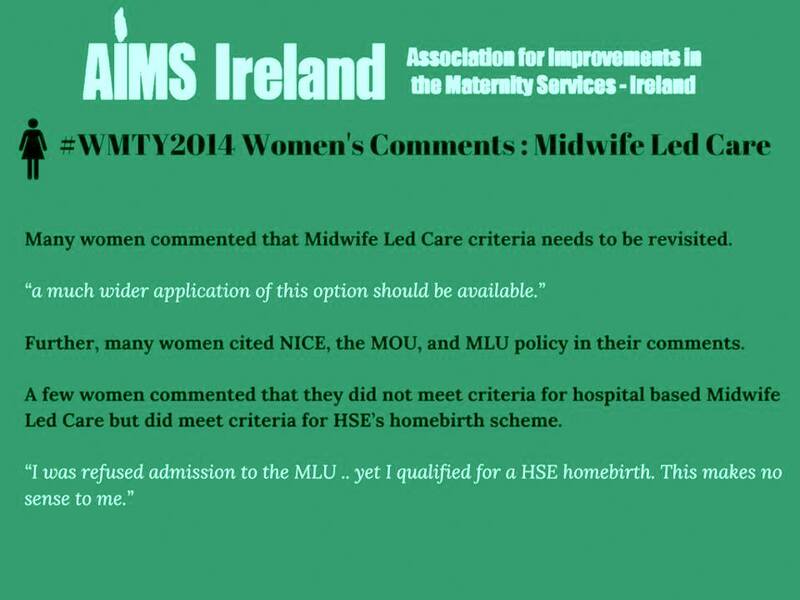 The 100 question survey examined women’s experiences from their perspectives on a variety of issues relating to care options in Irish maternity services, ante-natal care, labour and birth, and postnatal care. 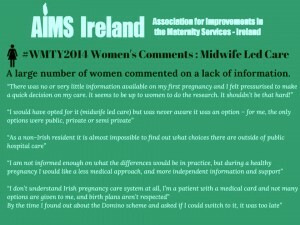 An independent analysis was compiled by statistical analyst not otherwise involved with AIMS Ireland or maternity/birth related activism or business. This section of the survey focused on the decisions that a woman and her family have to make near the start of her pregnancy; namely who is she going to choose as her care provider. The survey looked at how women make the choice, what information they use to make the choice and what choices are actually available to them. 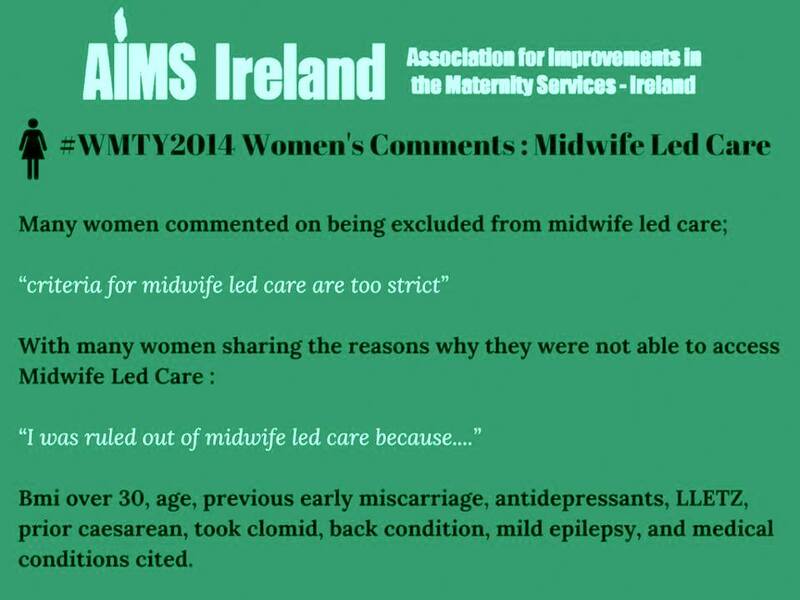 Only 5.5% of respondents stated that midwifery led care was currently available to them. Of those that did not currently have a homebirth service available to them, 19.7% said they would like to have homebirth service available to them. Midwife-led care has been defined by the Royal College of Obstetricians and Gynaecologists (2001) as care where: ‘the midwife is the lead professional in the planning, organisation and delivery of care given to a woman from initial booking to the postnatal period’. 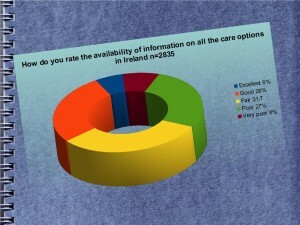 More than one in four respondents rated the information on maternity care provider as “poor”, and when this is combined with the “fair” rating of 31.7%, we can see that over half of the respondents felt that the availability of information on which to make a decision was sub optimal. Most women make their decisions based on information from their GP, from the internet and from friends and family. Out of these the GP is the traditional gatekeeper to information. Many respondents reported in their comments that their GP did not tell them that there were choices about care, and that most GPs focused on the choice between public semi private and public care rather than on the different type of caregiver or care model. As mentioned above the main gatekeeper for information appears to be the GP; as this information source was used by 51%, family and friends were the next most influential source of information and used by 46% of respondents. Hospital websites accounted for 20%, antenatal teachers for 3%, parenting fora and websites 24% books, TV, radio 4.7% AIMSI publications and 42weeks 3.3% Cuidiu publications and bumptobabe 2.5%, newspapers or magazines 1.5%. It would appear that respondents are seeking information from a much wider variety of sources than in 2010, with hospital websites featuring quite highly for the first time. 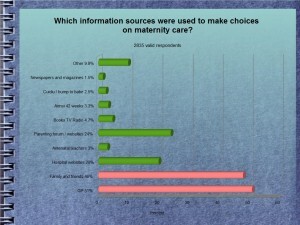 In written comments respondents mentioned that they would have liked to see more information related to care policies and policies during labour. 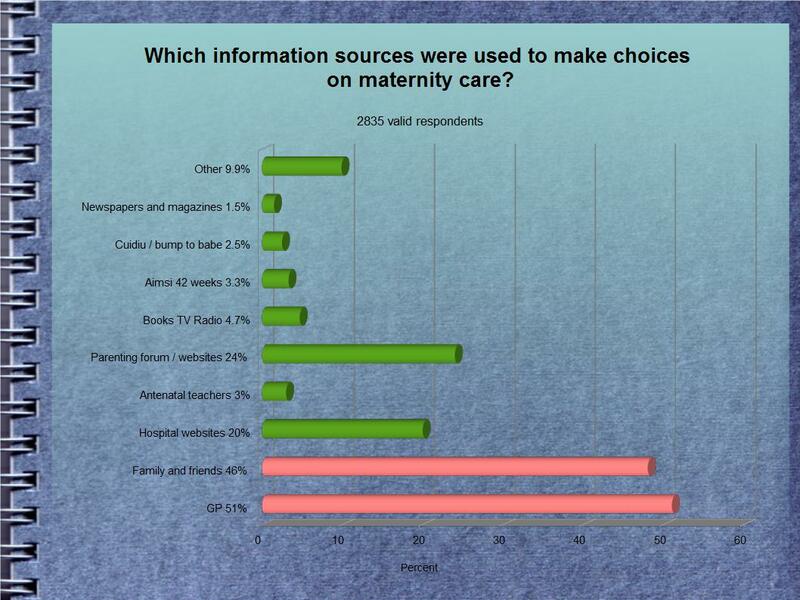 However, the GP still remains the key gatekeeper to information on maternity care options, and yet respondents also reported that the information they received from their GP was often limited sometimes out of date and not comprehensive. Respondents particularly reported problems with getting information about home birth from their GP. 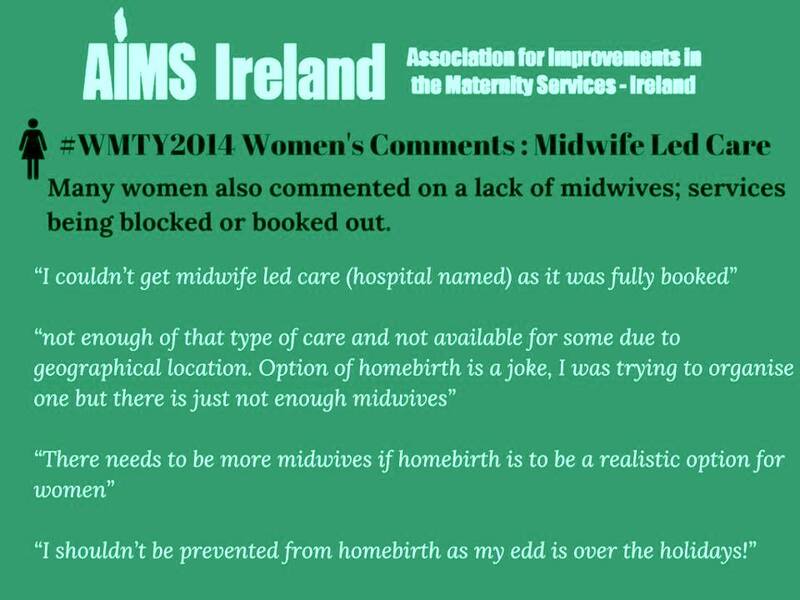 Many respondents stated that their GP had a very particular personal view about home birth and about other midwifery led care options where they were available. The increase in information source consulted however indicates that respondents are hungry for information and are actively trying to find out more about their options. The most frequently cited care available was public care (87.2%) followed by consultant led care, either public private or semi public (70.5%). Midwife clinics (but not midwifery led clinics) were substantially less available, with only 33.2% of respondents citing it as a care option available to them. 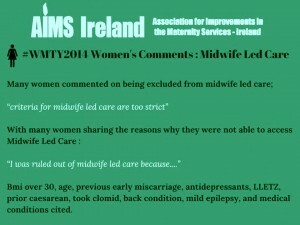 Midwifery led care and home birth options were noticeably less available at less than 10% each. 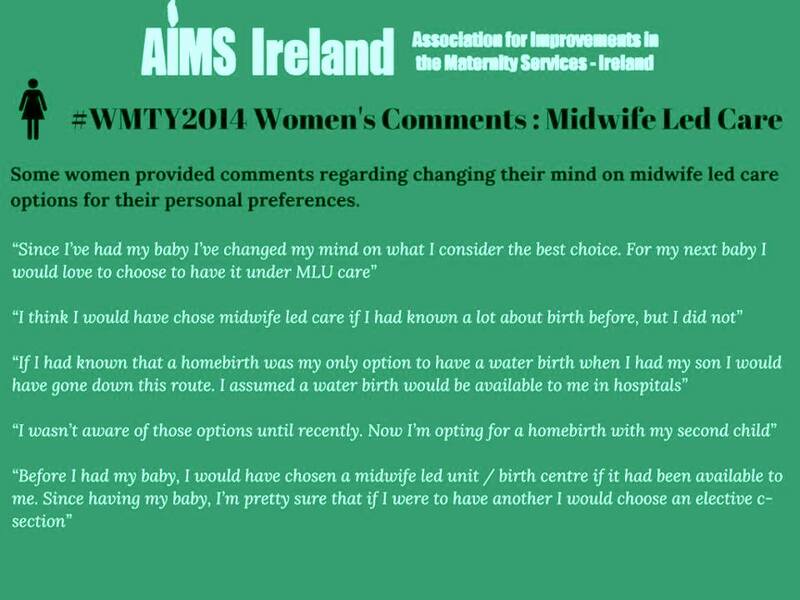 Given that the research shows us that most women will fare better with midwifery led options than with consultant led options, it is worrying to see so few respondents citing this option as available to them. 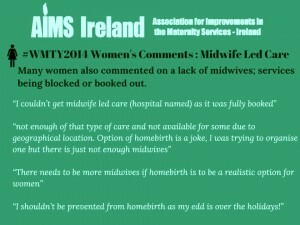 It is surprising to see that there appears to be even more homebirth options available than midwifery led options. This is probably partly due to the availability of homebirth in the NMH. The lack of midwifery led units and midwifery led care options is however stark and in direct contrast to options available to mothers in the UK where 99% of women have access to both an obstetric-led unit and a midwife-led unit within a 60 minute drive of their home. 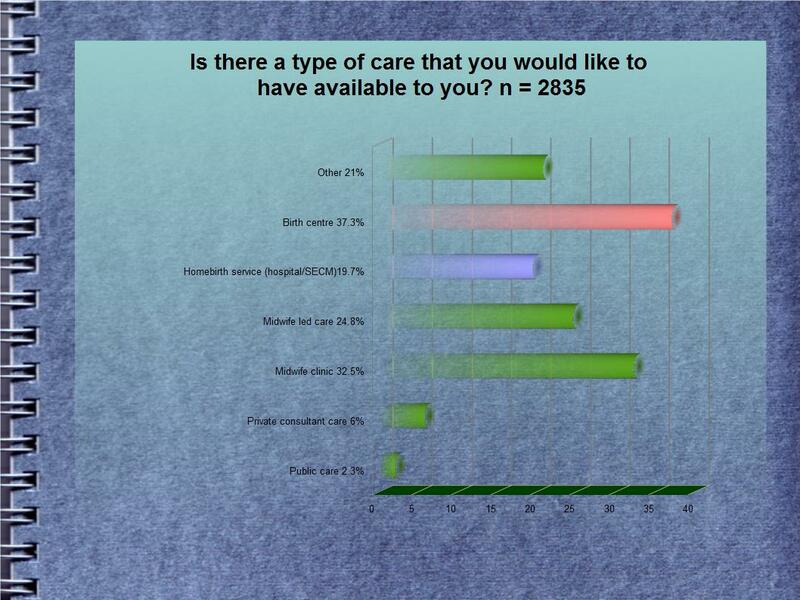 The majority of respondents chose either consultant led care (33.1%) or public care (46.9%) . 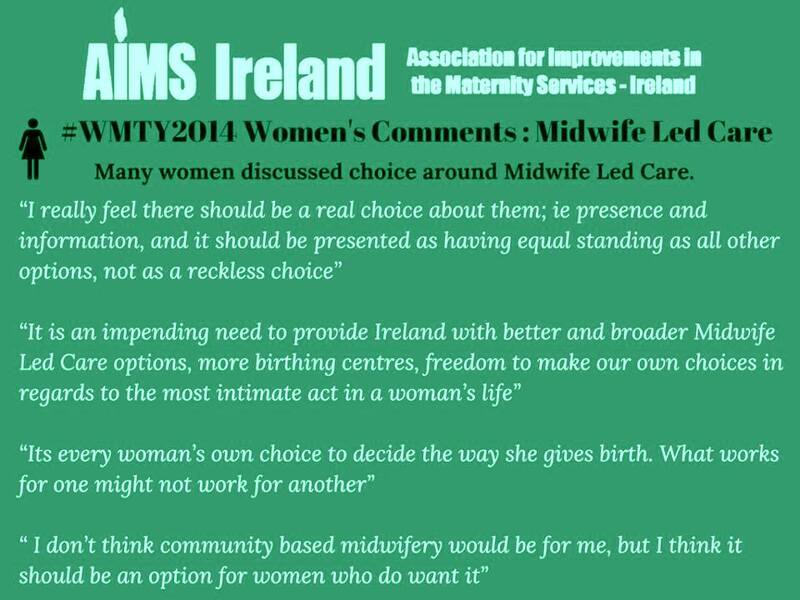 Just over 12% chose a midwifery clinic, but only 2.3% were able to chose midwifery led care. 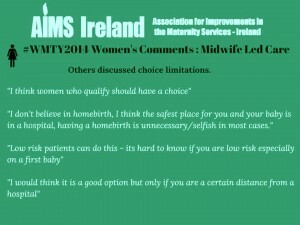 Nearly 5% of the population chose home birth with midwives working independently or within a hospital setting. Women’s choice of care provision will be determined by the level of provision associated with that model of care. In Ireland, the majority of care is provided by the consultant led model of care with women either opting for public private or semi private care depending on whether they have insurance or not. 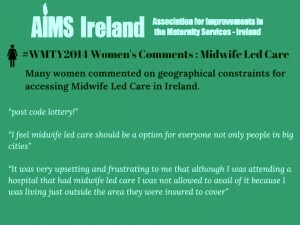 Essentially, women do not have a choice in terms of care model in Ireland. 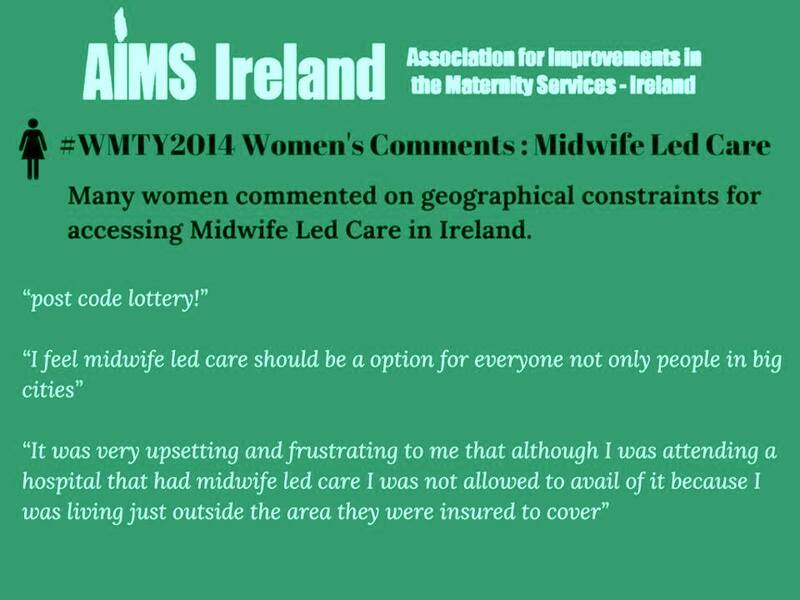 If choices in care model such as midwifery led units are available there are not equitable geographically, and certain areas of the country will have no choices in care provision. For most areas the choice is obstetric led care or home birth care. This is an extremely polarised choice for most women, especially women on their first baby, who may not want to attend a unit where they will more than likely be subject to a lot of interventions, yet on the other hand find the thought of a homebirth too radical. Q10. Is there a type of care you would like to have available to you? Valid respondents 2835 multiple answers. 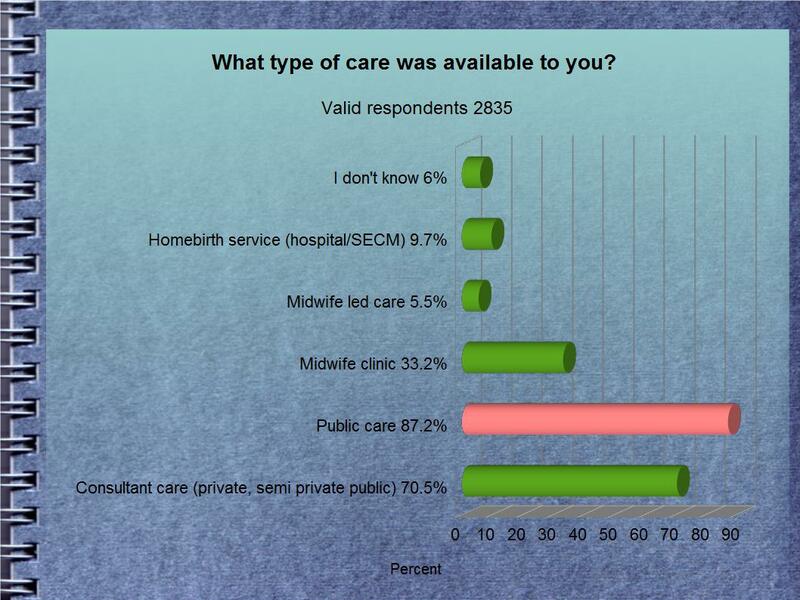 The most popular types of care that respondents wanted to see made available were birth centres (37.3%) followed by midwifery clinics (32.5%) midwifery-led care (24.8%) and homebirth care (19.7%). Table 5. 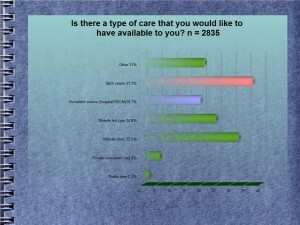 Type of care women would like to avail of that is not currently available. 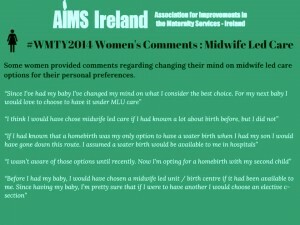 Respondents were keen to see alternative forms of care available involving midwives. 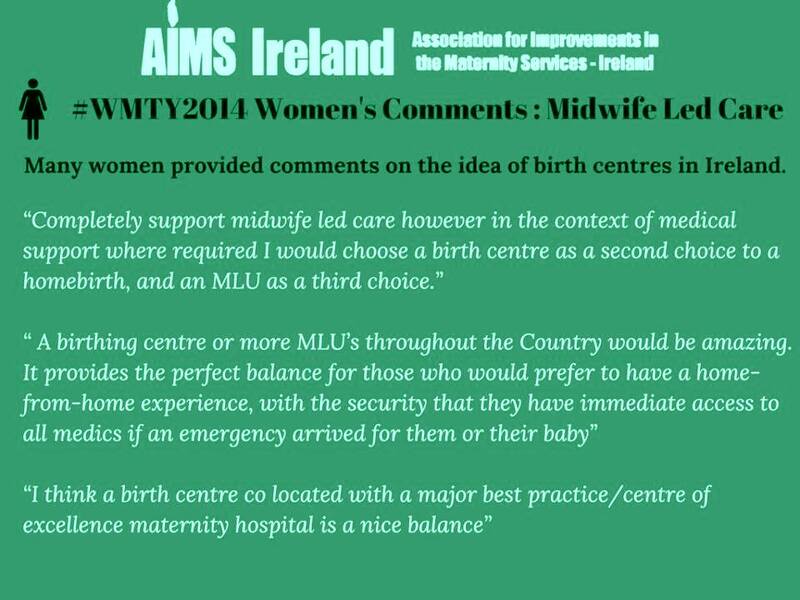 In particular respondents were interested in seeing more birth centres being made available. This is probably partly due to the prevalence of birth centres in the British model which are frequently discussed in the digital media and the internet. Women were also interested in other types of midwifery based care, both in ad out of the community setting. Two out of three respondents indicated that they would chose midwifery care if it were available to them; 55% did not currently have the option of midwifery led care, but would chose it as an option if it were offered and another13% percent did choose midwifery care as it was offered to them as an option. 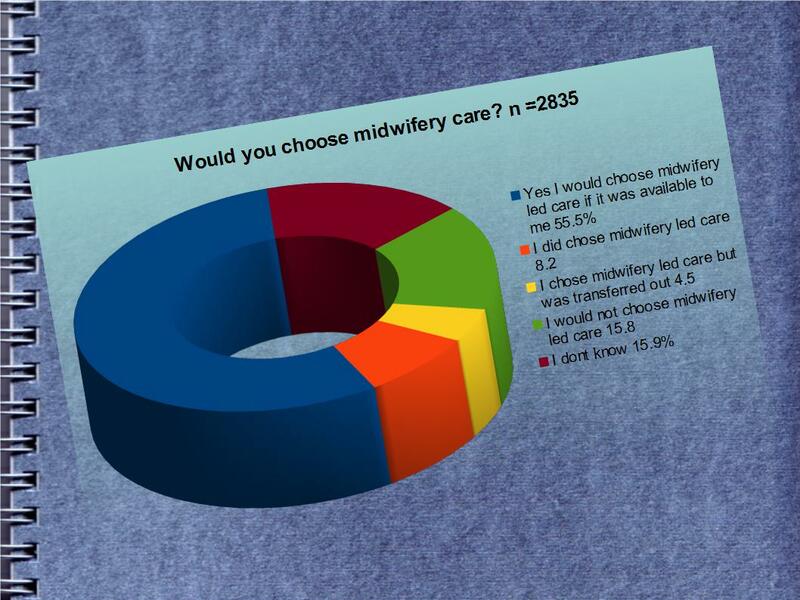 15.8% of respondents would not choose midwifery led care and a further 15.% was undecided. 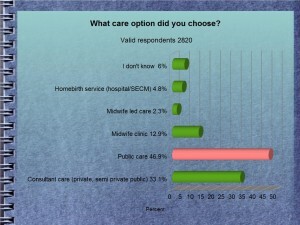 This aspect of the survey indicates that over half of the respondents are currently opting for a model of care that they would forgo for midwifery led care if midwifery led care was an option for them. 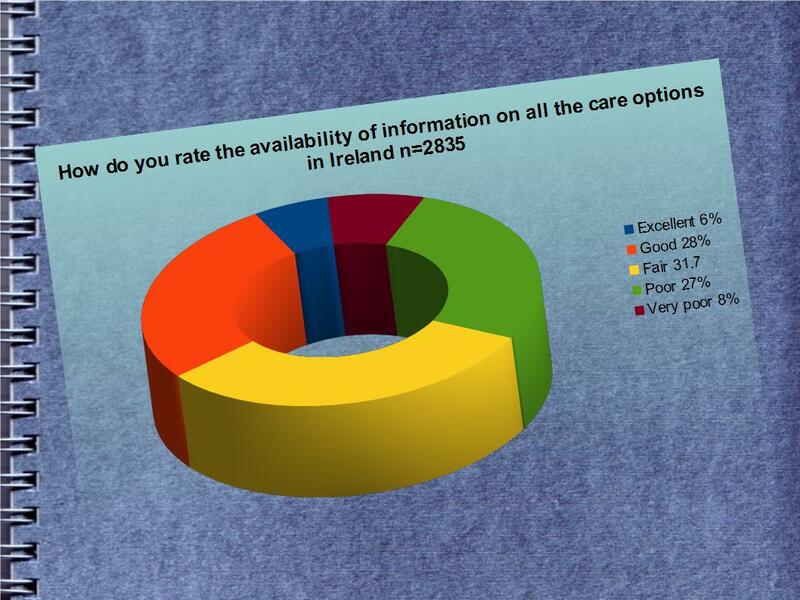 It indicates that a large cohort of respondents were not currently receiving their preferred choice of care in the Irish maternity system. 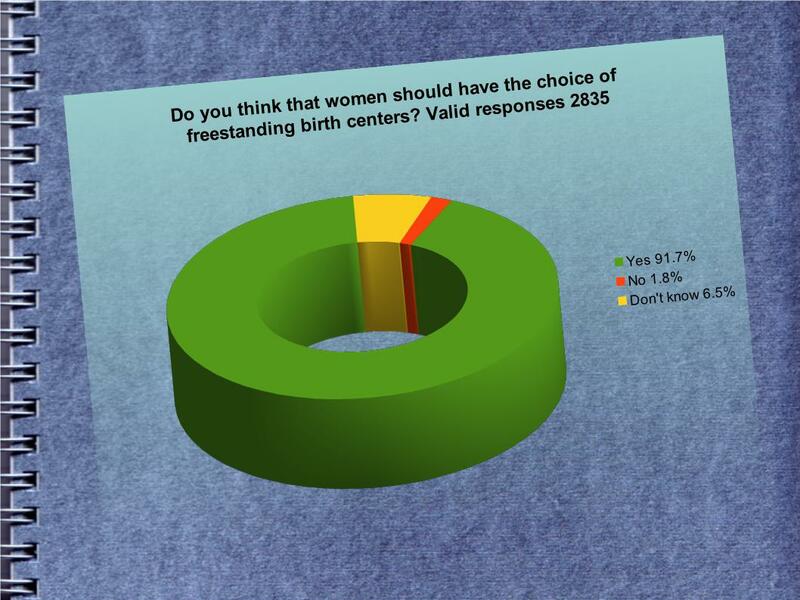 The overwhelming majority of respondents (91.7%) indicated that freestanding birth centers should be available as a choice to women in the Irish maternity system. Only 1.8% of respondents felt these should not be an option with 6.5% undecided. 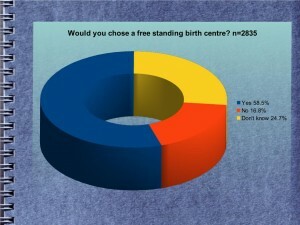 Ireland currently has no freestanding birth centres. 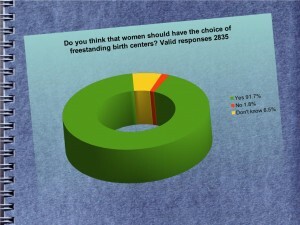 The overwhelming response to this question indicates that respondents felt freestanding birth centres are a vitally important component of a maternity service. 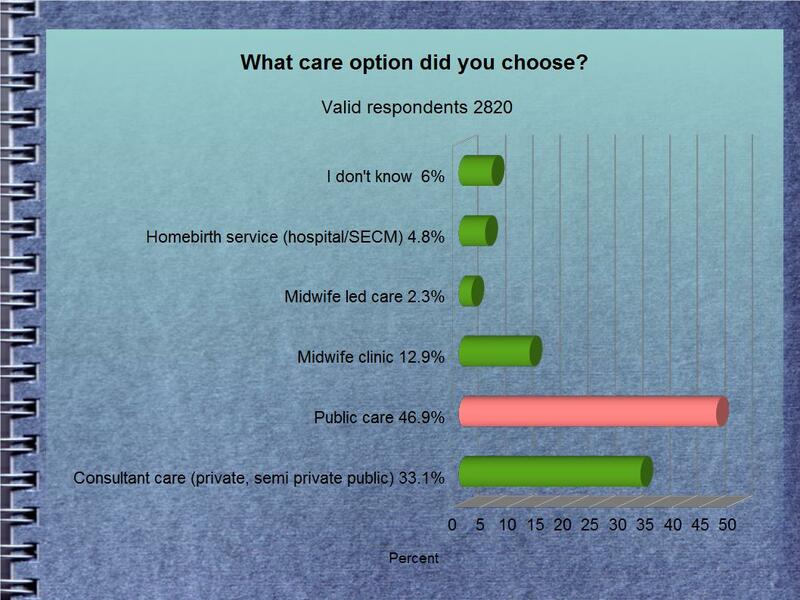 Over half of respondents (58.5%) indicated that they would choose a freestanding birth centre if one were available, 24% said that they were undecided and 16.8% said that they would not choose this model of care. The response to this question is interesting as it shows that whilst respondents may have felt that a freestanding birth centre should be available as a choice for women (see previous question), they wouldn’t necessarily choose it themselves. None the less, the response to this question indicates the strong positive demand that exists amongst service users for freestanding birth centres, as one in two women would use them. 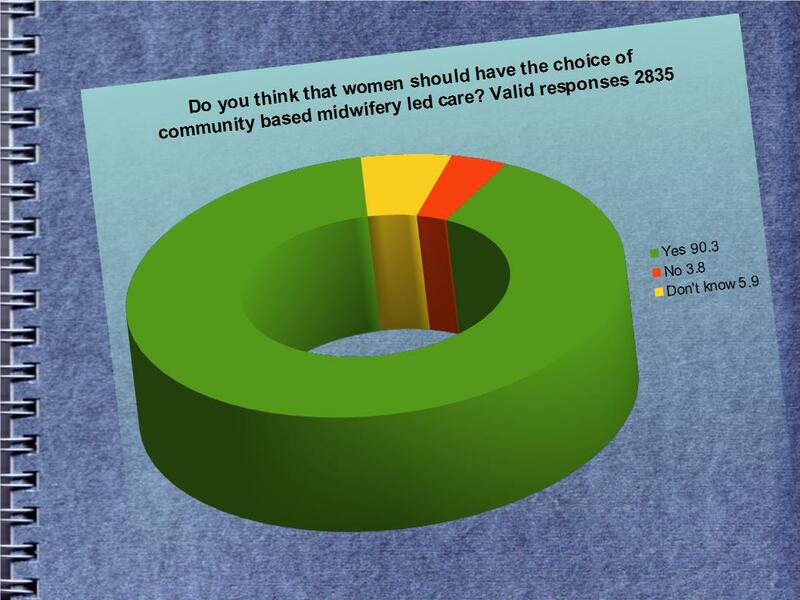 As with the previous set of questions on freestanding birth centres, the overwhelming majority of respondents (90.3%) felt that community midwifery services should be made available to women, with 5.9% undecided and 3.8% saying no. There was a unified call from respondents for more community based midwifery care. This type of care includes care in the community from a team of midwives, caseload midwifery or independent midwives and can include antenatal care, home birth and postpartum care options such as early transfer home. Nearly half of respondents (42/%) indicated that they would choose community based midwifery led care, with another 10% stating that they had chosen community based midwifery led care. 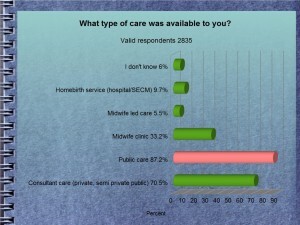 Just over a quarter of respondents, (28.6%) said that they would not choose this model of care and 19.3% were undecided. Table 10. 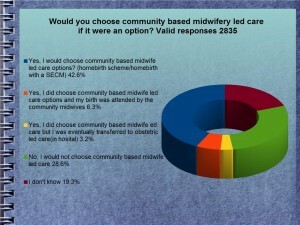 Respondent’s opinions on the choice of community based midwifery led care. We often hear in the media that women don’t want or are not interested in community based midwifery. We hear that the reason that there are so few home births is because the demand just isn’t there. Hopefully the response to this question from 2835 respondents will indicate the interest in these models of care to decision makers and policy makers. 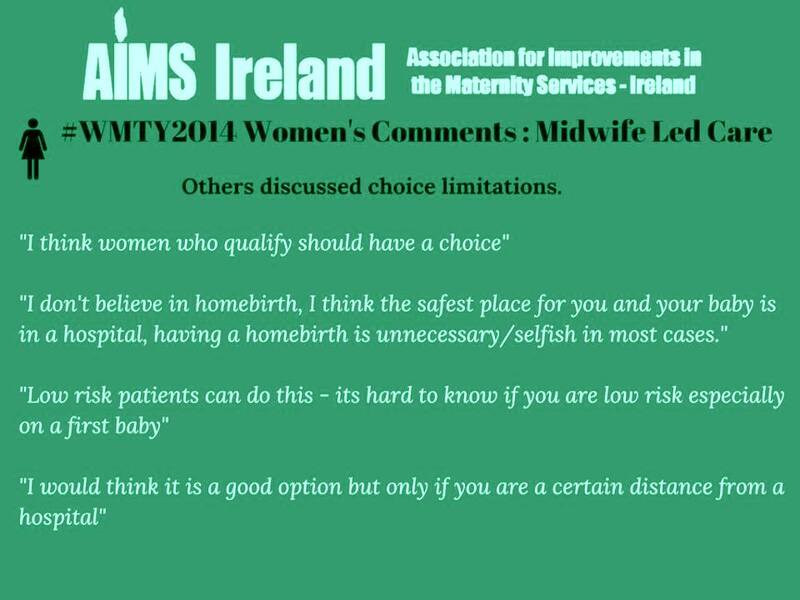 The desire for midwifery led care amongst maternity care service users in Ireland is much higher than the current provision of such care. The new Maternity Strategy for Ireland takes on board this view and has recommended an alongside birth centre for every maternity unit in Ireland. 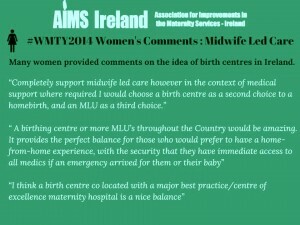 It is expected these alongside birth centres will be run along the lines of MLUs, with the midwife being the lead carer.